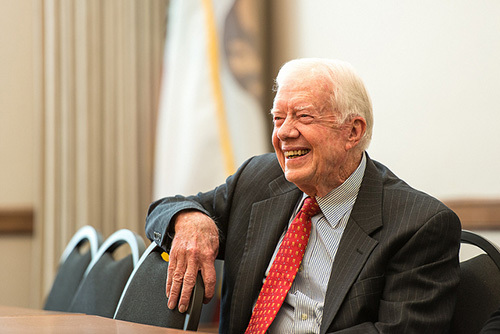 Last Wednesday, former U.S. President Jimmy Carter announced that he has cancer. Earlier this month, Carter had surgery to remove a small mass from his liver. He was expected to make a full recovery, but now the cancer has spread throughout his body. The recent diagnosis of 90-year-old Carter has generated a spotlight on how doctors treat elderly cancer patients. According to the American Cancer Society, one in three men over the age of 70 will develop invasive cancer. Also, 28% of new cancer cases are people over 75. In 2015, there will be an estimated 465,000 new cases. It is also believed that the number of elderly cancer survivors will increase by 40% over the next 10 years. Dr. Balducci uses a scoring system at the Moffitt Cancer Center in Tampa, Florida, that helps determine how elderly patients might respond to side effects from cancer treatments. Carter still hasn’t revealed his cancer type; however, his father, two sisters, and brother all lost battles to pancreatic cancer. From 1977 to 1981, Carter served as the 39th President of the United States. Jackson, H., et al., “Jimmy Carter’s Diagnosis: How the Elderly Fare With Cancer,” NBC News web site, August 16, 2015; http://www.nbcnews.com/nightly-news/jimmy-carters-diagnosis-how-elderly-fare-cancer-n410721. “Cancer Facts & Figures 2015,” American Cancer Society web site, http://www.cancer.org/acs/groups/content/@editorial/documents/document/acspc-044552.pdf, last accessed August 17, 2015. Schleifer, T., “Jimmy Carter says he has cancer and it has spread,” CNN website, August 13, 2015; http://www.cnn.com/2015/08/12/politics/jimmy-carter-cancer-liver-surgery/.